Are NetEase’s Days of High Growth Over? NetEase investors shouldn't miss these red flags. Over the years, NetEase (NASDAQ:NTES) has made the most of the opportunities presented by China's mobile and online gaming market, and has also diversified into fast-growing verticals like ecommerce to supercharge its prospects. Not surprisingly, NetEase investors have been a happy lot, as their investment in the Chinese internet specialist has experienced five straight years of double-digit percentage gains. However, 2018 looks to be a year worth forgetting for NetEase. The company seems to be losing its growth engines, sparking panic among investors -- who haven't hesitated to book profits. The above chart clearly shows that NetEase's earnings power has been waning for almost a year now. The market was kind enough to overlook this problem in 2017 as the company was busy expanding its ecommerce income streams -- but NetEase was just one step away from losing its earnings power, as mobile gaming and ecommerce are low-margin businesses. And it didn't take long for the company's bottom line to move south once mobile gaming started showing signs of faltering. Last quarter NetEase's online gaming revenue fell nearly 19% year over year. As this segment supplies close to 64% of the company's total revenue, that triggered a 4% drop in NetEase's top line. But the real kicker was the massive drop in the company's earnings: NetEase's adjusted net income fell almost 70% year over year in local currency terms, and that sent the alarm bells ringing. Mobile gaming and ecommerce are big businesses in China. Chinese consumers spent $11 billion on mobile games last year, up from just $3 billion in 2015. ecommerce is another fast-growing opportunity, as online sales in the country spiked 39% in 2017. The problem, however, is both are highly competitive spaces, and tough businesses from a margin perspective. NetEase has found this out the hard way. 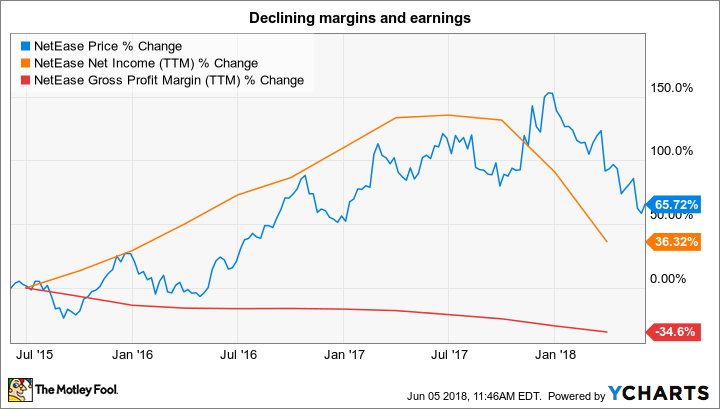 As long as the company's mobile gaming revenue was growing at an impressive pace, its earnings were increasing and the market wasn't paying much heed to the weakening margin. The company's online gaming revenue has dropped for two quarters straight, having declined 10% in the final quarter of 2017 before an even sharper drop this time. What's more, this is a company-specific weakness, as NetEase rival Tencent (NASDAQOTH:TCEHY) has been witnessing terrific mobile gaming traction. The company's mobile gaming business shot up 68% year over year to $3.4 billion in the first quarter. Indicating that Tencent's games are more popular than NetEase's, which isn't surprising; the former has diversified into the highly popular Battle Royale gaming format with the Battlegrounds franchise. NetEase has been slow to make this move, so it has been unable to offset the waning popularity of its legacy games. But the company is trying to get back on its feet. It recently unveiled a pipeline of over 20 mobile and PC games, and it will try to extend the life of its current games by launching expansion packs. In all, NetEase will spend more money to get its mojo back, so expect more bottom-line pressure in coming quarters. Its comeback cannot be guaranteed at this point -- Tencent has stolen the show in China's gaming scene with its wide portfolio of games to cater to the tastes of over 500 million gamers. The ecommerce story isn't much different, as NetEase is being forced to offer discounts to gain customers. Its ecommerce revenue doubled last quarter compared to the prior-year period, but gross margin fell from 13.1% last year to 9.5%. In fact, the ecommerce business' margins have been contracting consistently for the past several quarters. When coupled with the patchy margins in the online gaming business, it isn't surprising to see why NetEase has seen massive gross margin erosion of late. This trend of declining ecommerce margins looks set to continue considering the massive competition NetEase is going up against. The likes of Alibaba and JD.com control the bulk of the Chinese ecommerce space with a combined market share of over 80%. NetEase has set aside a huge amount of money to buy foreign inventory that it plans to sell in China. But it might be forced to offer discounts in a bid to achieve its target of gaining more market share. NetEase has a mountain to climb in China's ecommerce space, while the likes of Tencent are running away with the mobile gaming market. NetEase will have to spend more money in a bid to get back to its former growth, which is why its bottom line will remain under pressure until the turnaround begins.